Why should I buy a dog coat? Dog coats can provide your dog with added warmth and protection. Depending on the breed of dog, where you live and your lifestyle, many owners invest in a dog coat to shield them from precipitation, snow, sleet and harsh wind. Dog coats with reflective properties are great for early or late walks as they provide added visibility which is an important safety factor. Which coat is right for my dog? When choosing a dog coat, it is important to factor in your lifestyle and budget. Identifying key features that you would benefit from is a great starting point. If you are looking for a coat that has lasting durability, reflective properties and perhaps polyfill to keep your dog warm then a dog coat such as the WeatherBeeta Parka might be suitable. If your dog loves to run, a coat that offers leg straps with stabilize the coat and move with your dog. 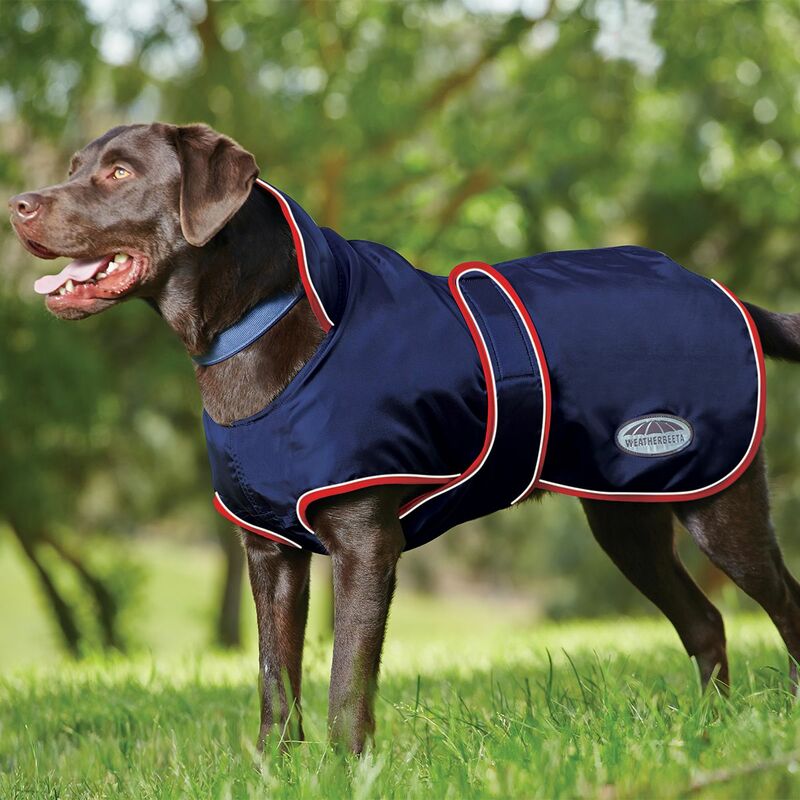 If you are looking for a dog coat that would be suitable for exercise, the WeatherBeeta dog coats are a great option. Other features dog owners look for features such as waterproof, night vision, breathe easy, wick easy or showerproof. Selecting the weight of your dog coat is based on your personal preference. Depending on where you live, the weather may be a contributing factor to the type of dog coat you choose to purchase. Owners who have dogs with a thick or double coat may be more inclined to choose a lighter weight option. However, if you live in a climate with cold winters, even a little polyfill in a coat can provide your dog added warmth and protection. 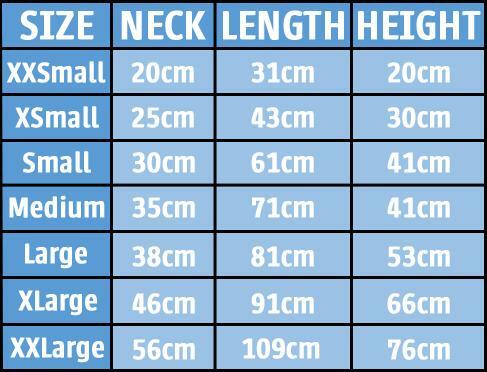 Please follow these simple steps as a guide to select the right size coat for your dog. 2. 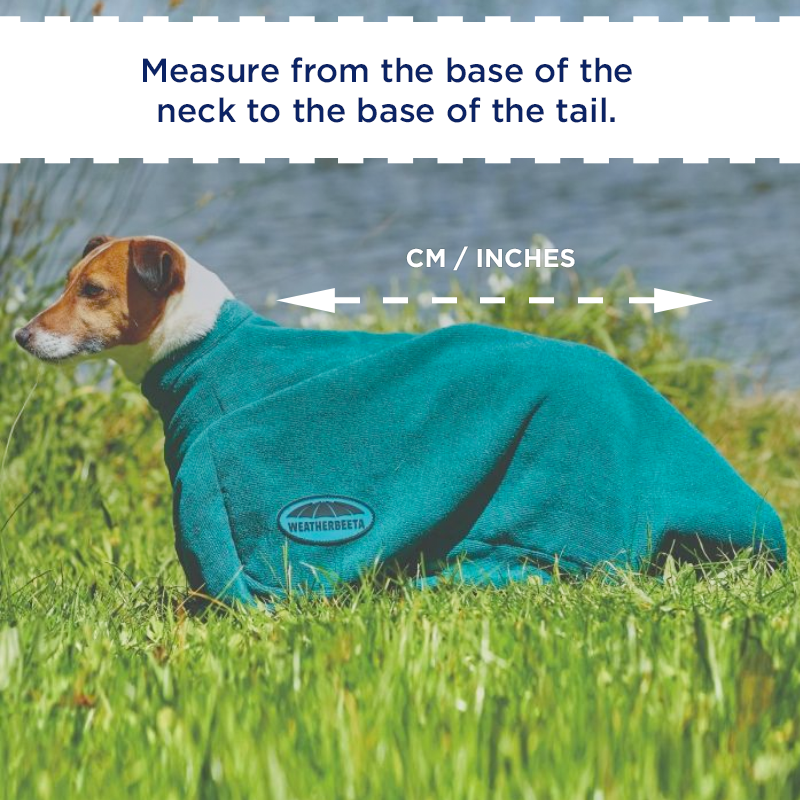 Take note of the number in centimeters as this measurement will match the size to the dog coat sizes available in the range. 3. Check with your local stockist if you’re unsure, and discuss taking your dog in to be fitted for their new coat. 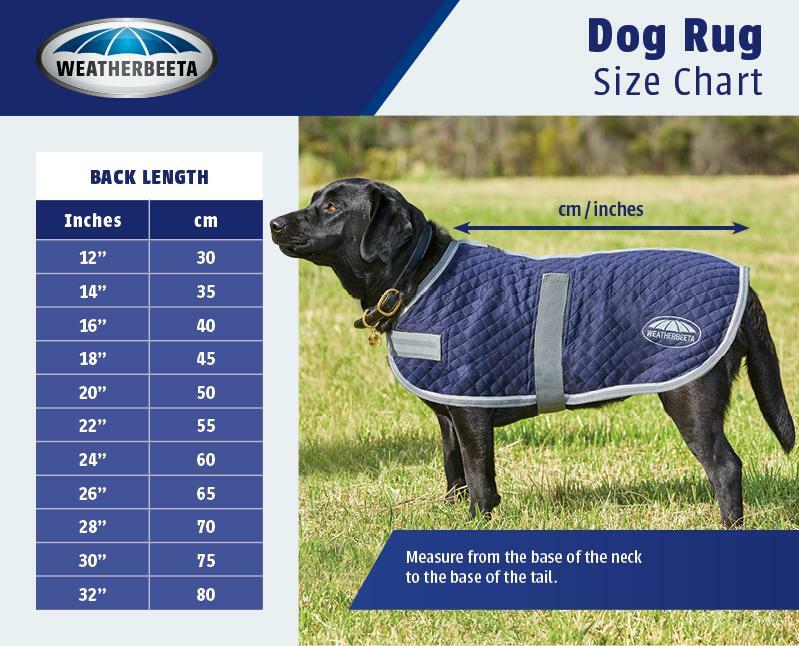 If your dog measures between two sizes, it is best to go up to the higher size as many of our dog coats offer adjustability with touch tape closures. How do I wash it/look after it? Please remove excess dirt, mud and hair from the coat. Prior to washing, please remove all detergent build up from your detergent dispenser. We advise that you place the coat in a mesh wash bag to contain all the straps and buckles; protecting them from being damaged whilst also protecting your machine. Machine wash the coat on a gentle, delicate cycle using a mild soap or reputable and recommended coat cleaning wash. (Always follow the manufacturer’s proofing instructions). Please do not use detergents or fabric conditioners as you risk compromising your WeatherBeeta’s unique waterproof and breathable coating. For best results, re-proof your coat to add durable water repellency and revitalize breathability. You can use a reputable and recommended rug proofer, always following the manufacturer’s proofing instructions. Please line dry your WeatherBeeta coat, do not tumble dry. 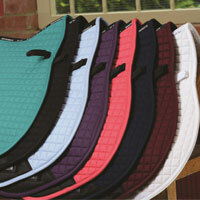 Warranty Registration for your WeatherBeeta horse rug.